1,3-Propanediol is the starting point of a new-generation polymer with superior properties which can be used in many industrial fields. 3-Hydroxypropionaldehyde and lactate have been identified as two important metabolites in the biological route of 1,3-propanediol bioconversion from glycerol. 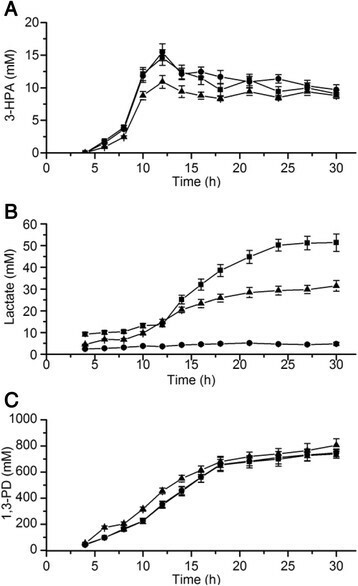 Here, influence of lactate on the inhibition caused by 3-hydroxypropionaldehyde of 1,3-propanediol fermentation by Klebsiella pneumoniae is reported. The influences of 3-hydroxypropionaldehyde and lactate on 1,3-propanediol production were investigated in normal and lactate pathway deficient strains with different fermentation conditions. By using the strains KG1 and L-type lactate dehydrogenase-deficient mutant (KG1Δldh), the results indicated that an early accumulation of 3-hydroxypropionaldehyde directly inhibited the 1,3-propanediol production rather than through lactate accumulation during the late stage of fermentation. Then, the influence of extra addition of lactate on the late stage of fermentation was investigated, and the inhibitory effect of lactate did not appear. At last, it was found that by reducing 3-hydroxypropionaldehyde accumulation in the early stage of fermentation, the concentration and yield of 1,3-propanediol increased by 18% and 16%, respectively, over the initial experimental levels. An early accumulation of 3-hydroxypropionaldehyde directly decreased the final 1,3-propanediol concentration rather than through lactate accumulation during the late stage of fermentation. 1,3-Propanediol (1,3-PD) can be formulated into numerous industrial products such as composites, adhesives, and laminates. With the increasing emergence of novel applications of 1,3-PD, the demand for its biological production has been on a rise []. The conventional chemical conversion of acrolein (also known as propenal) into 1,3-PD has several drawbacks []. Nevertheless, the bioconversion of 1,3-PD from glycerol by Klebsiella pneumoniae has attracted much attention worldwide, and numerous efforts have been made to enhance the 1,3-PD fermentation, such as construction of recombinant K. pneumoniae strains [-]. Due to the tremendous growth of the biofuel industry, a glycerol surplus has been created, resulting in a decrease in glycerol prices. Compared with the recombinant E. coli producing 1,3-PD from glucose described in a patent by Nakamura and Whited [], the K. pneumoniae strain producing 1,3-PD from glycerol as substrate has lots of advantages and is being refocused []. The production of 1,3-PD by K. pneumoniae is generally performed under anaerobic conditions with glycerol as the sole carbon source. In the metabolic reactions, glycerol is dissimilated through coupled oxidative and reductive pathways [,,-,]. The reductive branch consists of two steps: glycerol is first dehydrated to 3-hydroxypropionaldehyde (3-HPA) and then 3-HPA is reduced to 1,3-PD under the consumption of reducing power (NADH). Reducing power and various byproducts were produced in the oxidative branch. Among the intermediates and by-products, 3-HPA has been identified as an important intermediate during the fermentation course and lactate is the main byproduct in the final fermentation result, accumulation of either can decrease the 1,3-PD concentration [,]. If lactate accumulates to high levels, it impedes cellular activity [] and decreases the final 1,3-PD concentration by consuming NADH []. Hao et al. [] reported that a very high concentration of 3-HPA could inhibit the growth of, and lead to the death of, cells. 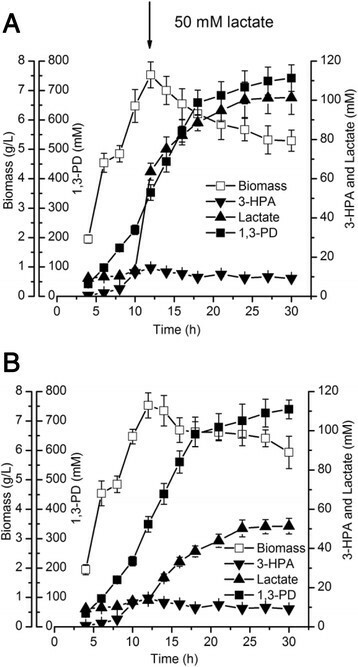 When the concentration of 3-HPA increases to a higher level in the medium (ac 10 mM), the activity of the 1,3-propanediol oxidoreductase in the cells decreases correspondingly, which leads to a decrease of the 3-HPA conversion rate. Then, the accumulation of 3-HPA is accelerated furthermore. 3-HPA accumulation in culture medium is triggered by this positive feedback mechanism. However, the mechanism of inhibition caused by moderate concentrations of 3-HPA has not been studied systematically. As an intermediate product, 3-HPA accumulates in the early stage of fermentation. The accumulation of 3-HPA in the culture medium can significantly decrease most of the enzymatic activities in K. pneumoniae strains with the exception of lactate dehydrogenase (the key enzyme in the interconversion of lactate to pyruvate) []. If the concentration of 3-HPA in the early stage of fermentation is high, then lactate will accumulate to reach a high concentration during the late stage of fermentation. Hence, it is not clear whether the decrease of final fermentation concentration of 1,3-PD is caused by 3-HPA accumulation in the early stage of fermentation or due to lactate accumulation in the late stage of fermentation. Clarifying the mechanism of inhibition caused by 3-HPA concentrations could help researchers to ‘fine-tune’ the entire bioprocess. In the present study, influences of 3-HPA and lactate on 1,3-PD fermentation was investigated using two strains (KG1 and KG1Δldh (lactate dehydrogenase-deficient strain engineered from KG1)), and then 1,3-PD fermentation process was optimized by strategic glycerol feeding to keep the 3-HPA below the inhibitory level []. The KG1Δldh strain was constructed by homologous recombination. Gene (ldhA) was selected for knockout by Red recombination []. The disruption cassette was amplified by two-step PCR from the chromosomal DNA of K. pneumoniae and pKD4, in which the upstream and downstream homologous extensions of target gene were amplified with two pair of primers (5′-ATGAAAATCGCGGTTTAT-3′, 5′-AAGCAGCTCCAGCCTACACATGGGCCTTCAGCTCTTCC-3′; 5′-AGGAGGATATTCATATGGACGCGATCTGTTCTTTGAAG-3′, 5′-TTAGACGATGGCGTTCGG-3′) and kanamycin resistance gene was amplified with one pair of primers (5′-TGTGTAGGCTGGAGCTGCTT-3′, 5′-GTCCATATGAATATCCTCCT-3′). For Red facilitated homologous recombination in K. pneumoniae, the pKD46-Tc was first transformed into the parent cell. Next, the disruption cassette of the target gene was further transformed into the parent cell with pKD46-Tc. The recombined strain was screened on LB plates containing kanamycin and grown at 37°C. To delete the kanamycin resistance gene in the recombined strain, pCP20-Tc was transformed into the recombined strain. Cells were then cultured overnight at 42°C, diluted and plated onto solid LB to form single colonies, which were further screened for loss of kanamycin and tetracycline hydrochloride resistance. KG1 was obtained by the screening of wild-type K. pneumoniae, and the KG1Δldh strain was constructed by homologous recombination []. These strains have been grown on a pre-culture medium containing (per liter) 3.4 g K2HPO4·3H2O, 2 g (NH4)2SO4, 1.3 g KH2PO4, 0.2 g MgSO4, 1 g yeast extract, and 0.3 mL trace element solution composed of (per liter) 70 g ZnCl2, 3.2 g NiCl2·6H2O, 10 g MnCl2·4H2O, 20 g CoCl2·2H2O, 0.6 g H3BO3, and 0.45 g Na2MoO4·2H2O. Each liter of fermentation medium comprised 1 g KCl, 2.15 g KH2PO4·2H2O, 4 g (NH4)2SO4, 0.4 g MgSO4·7H2O, 2 g yeast extract, and 0.4 mL trace element solution. The seed cells were incubated in 500-mL flasks containing 100 mL seed medium, at 37°C, 200 rpm for 10 h. Fed-batch fermentation in a 5-l stirred reactor (NC Bio, Shanghai, China) was carried out under anaerobic condition with a 5% (v/v) inoculation at 140 rpm at 37°C for 30 h. The initial glycerol concentration was 40 g/L and was maintained around 20 g/L (±5 g/L) by feeding glycerol during the entire fermentation process. The pH value was maintained 6.8 by the automatic addition of 50% (w/w) KOH. The cell optical density was related to the dry cell weight (DCW) with an experimentally determined calibration curve. The optical density (OD) of the cultures was monitored at 650 nm after appropriate dilution. The broth components were measured using a HPLC system equipped with a 2487 Dual-Wavelength Absorbance Detector (Waters, Milford, MA, USA) and a Platisil ODS column (5 μm, 250 M × 4.6 M; Dikma Technologies, Beijing, China). The column temperature was 65°C, and the mobile phase was 5 mM H2SO4 at 0.8 mL/min. The 3-HPA concentration was measured using the tryptophan colorimetric method []. The cell growth, glycerol consumption, and metabolites production during the fed-batch fermentation using KG1 with an initial glycerol concentration of 40 g/L were illustrated in Figure 1. In terms of 3-HPA and lactate formation, fed-batch fermentation can be divided into two stages: stage I (0 to 12.5 h) was the early stage of fermentation, in which cells were growing and the biomass and 3-HPA concentration reached a peak. Stage II (12.5 to 30 h) was the late stage of fermentation, in which the concentrations of lactate and 1,3-PD increased gradually. In stage II, glycerol was fed and maintained around 20 g/L (217 mM) till the end of the fermentation. Due to dilution of the medium, a slight decrease in biomass was observed. Time course of 1,3-propanediol fed-batch fermentation by KG1. With an initial concentration of glycerol of 40 g/L. Open squares, biomass; closed squares, 1,3-PD; open triangles, glycerol; closed triangles, lactate; closed inverted triangles, 3-hydroxypropionaldehyde (3-HPA). Figure 2A,B illustrated the relationship between 3-HPA accumulation in stage I with lactate formation in stage II. Despite the initial concentration of glycerol, no conditions were changed during the entire fed-batch fermentation by KG1. With an initial glycerol concentration of 40 g/L, a peak concentration (14.6 mM) of 3-HPA at 12 h in stage I was observed (Figure 2A). The peak concentration of 3-HPA decreased by 25% to 10.9 mM (Figure 2A) with the initial concentration of glycerol lowered to 30 g/L. 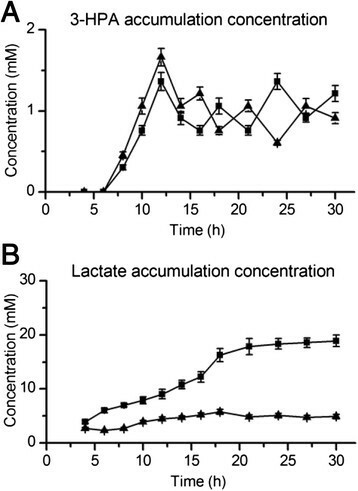 Compared with initial glycerol concentration of 40 g/L, the final concentration of lactate decreased by 39% to 31.4 mM (Figure 2B), and the cell growth and 1,3-PD production at the end of fermentation increased by 10% and 9%, respectively, at the condition of initial glycerol concentration at 30 g/L (Table 1, Figure 2C). Time course of end-products by KG1 and KG1Δldh with different initial concentrations of glycerol. 3-hydroxypropionaldehyde (3-HPA) (A), lactate (B), and 1,3-PD (C). Closed squares, KG1 with 40 g glycerol/L; closed triangles, KG1 with 30 g glycerol/L; closed circles, KG1∆ldh with 40 g glycerol/L. The datapoints represent the mean values and standard deviations of three parallel experiments. (+50) = 50 mM lactate adding into the fermentation media in the late stage of fermentation. Yield of 1,3-propanediol is on basis of mass. The date are final values except 3-HPA; the data of 3-HPA are peak values in 12 h of fermentation. Values are the mean values and standard deviations of three parallel experiments. These results suggested that 3-HPA concentration vary with different initial concentrations of glycerol: the higher the initial concentration of glycerol, the higher the 3-HPA concentration in the early stage of fermentation. And there was a close relationship between 3-HPA accumulation in the early stage of fermentation and lactate accumulation in the late stage of fermentation: a higher concentration of 3-HPA resulted in a higher concentration of lactate. A higher concentration of 3-HPA during the early stage of fermentation significantly affected the final concentrations of the biomass and 1,3-PD, as did the lactate concentration in the late stage of fermentation. To investigate whether 3-HPA accumulation during the early stage affected cell growth and 1,3-PD production indirectly through lactate accumulation during the late stage of fermentation, a fed-batch fermentation with initial glycerol concentration of 40 g/L by using a lactate dehydrogenase-deficient strain (KG1Δldh) was examined. 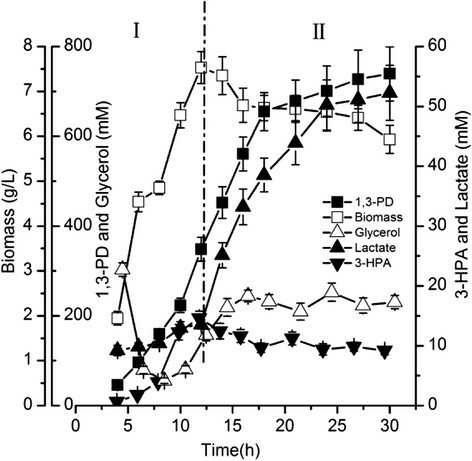 Although the concentration of lactate was very much lower due to the deficiency of lactate dehydrogenase [] (Figure 2B), the variations of 3-HPA was almost the same as that of KG1 (Figure 2A). The final concentrations of biomass and 1,3-PD by KG1Δldh were almost identical to that by KG1 (Table 1, Figure 2C). The above results suggested that lactate accumulation during the late stage of fermentation do not have an obvious influence on 1,3-PD formation in cells. So, 3-HPA accumulation during the early stage of fermentation decreased the 1,3-PD concentration directly rather than through lactate accumulation during the late stage of fermentation. Maybe this was because of the 3-HPA accumulation during the early stage of fermentation inhibited the central carbon pathway at the post translation level of the cell growth, which could result in irreversible damage to cells in the fermentation broth and would cause an irreversible cessation of the fermentation process until the end of fermentation [,]. Lactate synthesized by the oxidative pathway in K. pneumoniae, which competed NADH with 1,3-PD formation []. It was reported that NADH derived from blocking lactic acid synthesis pathway was used to produce 2,3-BD instead of 1,3-PD []. Our experiments data also showed that, compared with KG1, the final concentrations of 2,3-BD increased by 17% while the final concentration and yield of 1,3-PD were almost unchanged by KG1Δldh. When KG1Δldh was cultured at an initial glycerol concentration of 30 g/L, lactate was added in stage II to maintain a concentration around 50 mM. Compared with the culture of KG1 at an initial glycerol concentration of 40 g/L, the final cell density and 1,3-PD concentration were increased with a decreased 3-HPA in stage I, even though the lactate concentration was similar (Table 1). To further investigate the effect of lactate in the late stage on 1,3-PD production, 50 mM of lactate was added to the late stage of the 1,3-PD fed-batch fermentation using KG1 with an initial glycerol concentration of 40 g/L. The result was shown in Figure 3A,B. With the addition of 50 mM lactate in stage II, the growth of cells was slightly inhibited, the final biomass concentration was 5.3 g/L and was 10% lower than that without lactate addition. 1,3-PD concentration was 742 mM, which was nearly unchanged with that without adding 50 mM lactate (Table 1). In 1,3-PD production by K. pneumoniae, lactate is main byproducts and can even reach 450 mM in the broth [,]. In our experiments, within the concentration of 100 mM, lactate has no inhibitory effect on 1,3-PD production, indicating that 3-HPA, rather than lactate, inhibits 1,3-PD production. The effect of extra addition of lactate on the late stage of fermentation. 1,3-propanediol fed-batch fermentation by KG1 with an initial concentration of glycerol of 40 g/L, in (A), 50 mM lactate were added into the fermentation media in the late stage of fermentation. And in (B), there is no addition of lactate. Open squares, biomass; closed triangles, lactate; closed inverted triangles, 3-hydroxypropionaldehyde (3-HPA). The datapoints represent the mean values and standard deviations of three parallel experiments. Based on the results shown above, further experiments were executed using an initial concentration of glycerol of 20 g/L. The 3-HPA concentration curve using KG1Δldh was almost the same as that of KG1 (Figure 4A) and they were the lowest among all of experiments due to the lowest initial concentration of glycerol. The final lactate concentration by KG1 was much lower than that with 40 g/L glycerol, whereas, by KG1Δldh, the concentration was below the detection limit (Figure 4B). The concentrations of biomass and 1,3-PD were virtually identical (Table 1). The concentration and yield of 1,3-PD increased by 18% and 16%, respectively, compared to the original experimental method with KG1. Time course of end-products by KG1 and KG1Δldh with lower initial concentration of glycerol. 3-hydroxypropionaldehyde (3-HPA) (A) and lactate (B). Closed squares, KG1 with 20 g glycerol/L; closed triangles, KG1∆ldh with 20 g glycerol/L. The datapoints represent the mean values and standard deviations of three parallel experiments. In this study, several 1,3-PD fed-batch fermentations had been carried out by using the strains KG1 and KG1Δldh to clarify the effects of inhibition caused by moderate 3-HPA concentrations during fermentation. The results indicated that 3-HPA accumulation during the early stage of fermentation was the main inhibitor in the fermentation and the inhibitory effect was unaffected by lactate accumulation during the late stage of fermentation. The influences of extra lactate being added into the fermentation media in the late stage of fermentation on the cell growth and 1,3-PD production was also investigated, and a concentration of 100 mM lactate was observed to have no inhibitory effect on 1,3-PD production. Based on the above results, a new fed-batch fermentation process using an initial glycerol concentration of 20 g/L by KG1 was developed, the concentration and yield of 1,3-PD reached 872 mM and 64%, respectively, which were increased by 18% and 16%, respectively, over the initial experimental levels. The information gained in this study could be helpful to enhance 1,3-PD production by finely controlling the entire bioprocess. ZZ designed and drafted the manuscript. JZ carried out the molecular genetic studies, participated in the sequence alignment, and drafted the manuscript. LG participated in the sequence alignment. LL and SF participated in the design of the study and performed the statistical analysis. JX conceived of the study, participated in its design and coordination and helped to draft the manuscript. HG guided our design, draft and revise of the study during the whole processing. All authors read and approved the final manuscript.